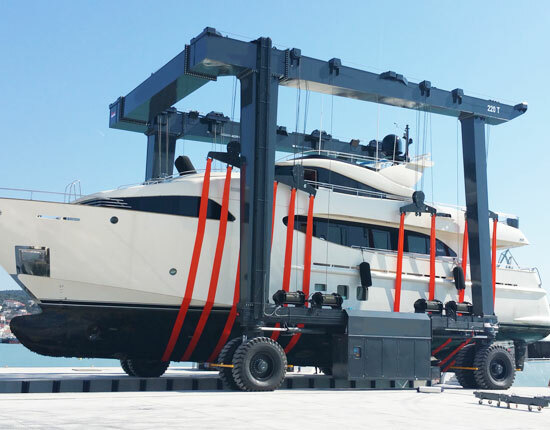 Mobile boat crane provides great flexibility for handling of large ships and yachts since it is equipped with four-wheel independent steering system. The boat crane also offers excellent maneuverability so that it can function perfectly even in a confined space. This piece of boat handling equipment is widely used in shipyard, marina, yacht club, water recreation center and commercial yard. Ellsen machinery supplies the most durable and reliable mobile boat cranes to clients and offers custom design to meet their special requirements. The mobile boat crane is capable of lifting 10 tons to over 1000 tons boats, and according to the weight of boat it handles, the boat hoist crane can be divided into small boat lift, medium boat hoist and large boat lift. The small boat hoist is typically used to lift 10 tons to 100 tons weight. It is an ideal option for small marinas, shipyards and docks. The medium boat crane can handle vessels ranging from 150 tons to 500 tons. It is ideal for lifting fishing boats, large yachts and other commercial vessels. The large boat lift crane has the capability to handle 600 to 1200-ton vessels. It is more often found in large marinas, shipyards and commercial yards to lift and transport large ships, such as super yachts and tugs. 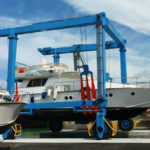 Whether you are lifting a small sailboat or super yacht, you can find a proper mobile boat crane in Ellsen that is built with excellent efficiency, precision and durability. Our boat crane lift adopts full hydraulic drive system. The flexible slings are used to protect the hull. Operation and steering modes vary widely. Generally, there are straight travelling, oblique travelling, fixing axle steering, 90 degree steering and Ackermann steering. Flexible configurations are available, such as variable span design, movable lifting points and variable lifting stroke. Our mobile boat crane uses superior paint to resist corrosion in harsh marine environments. 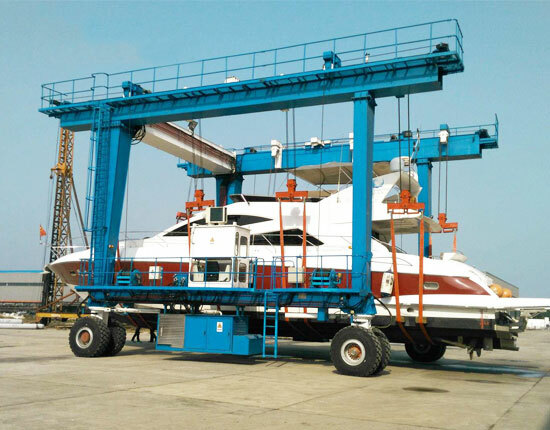 The boat lift crane consists of a double-gantry U frame structure, making it perfect for handling large-sized boat. The general functions of it include lifting in and out of vessels and transporting in the maintenance or repairing yard. The mobile boat crane can also be used to lift and move ships in the yard and arrange them in rows so as to increase the utilization of limited yard space. Our mobile boat lift is meant for the utmost efficiency and safety of boat handling process as well as trouble-free lifting operations. With our professional technical team, we are able to solve any problem you have and bring the maximum profits for your businesses. Since the mobile boat hoist is more often employed in or near the body of water, it is vital to take some measures to resist corrosion in harsh marine environments. Use stainless steel tubing to resist corrosion in salt-water environments. Paint the crane with superior primer and top coat for better corrosion resistance and appearance. Beam formed structure is meant for a longer working life. Articulated pivot trunnion can perfectly eliminate structural stress for the machine when travelling on uneven ground. The slings can be adjusted to keep multiple lifting points synchronously lifted, and at the same time output power according to load conditions. In this way, the energy consumption of the whole machine can be reduced. Ellsen travel lift can provide you with the benefits of custom design, quality assurance and dependable service. If you are unsure as to which sort of machine is right for you, please feel free to contact us. Typically, there are two ways of operating your mobile boat crane, remote control and cabin control. Each control mode has its own pros and cons with respect to the ease of use, cost and safety. The remote control is an economical option, which is more suitable for light duty lifting operations. Whereas cabin control is more often found in large tonnage boat hoists for more efficient and safer lifting operations. Before commencing any lift, the operator should check some critical parts of the equipment to ensure a safe lifting operation, such as checking engine oil level, lifting straps, steering wheels and wire cable. The vessels over rated load capacity should not be lifted. No lifting operations should be performed in severe environmental conditions, such as strong winds. Personnel in the working area should be restricted to those that are responsible for lifting operations. Never drag the travel lift slings. Once the job is done and no more vessels to be handled, the boat travel lift should be parked aside for water drainage. 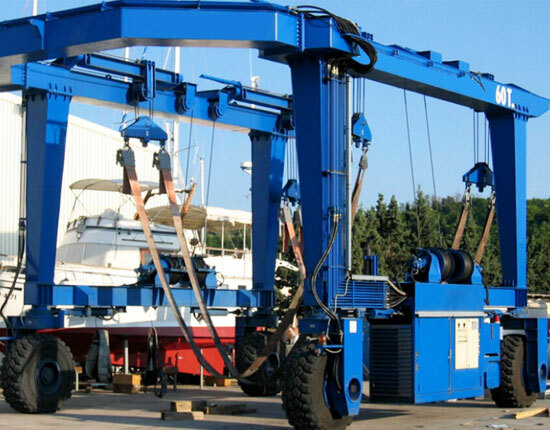 To know more about proper usage of boat lift crane, call us now or send an email to us. 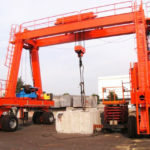 We provide a variety of mobile boat cranes for clients, and each one will be uniquely engineered according to their requirements. Our boat lift is capable of handling any type of vessel, including sailboats, fishing boats, powerboats, yachts and tugs. According to your boat configurations, we will design the most economical and efficient solutions. 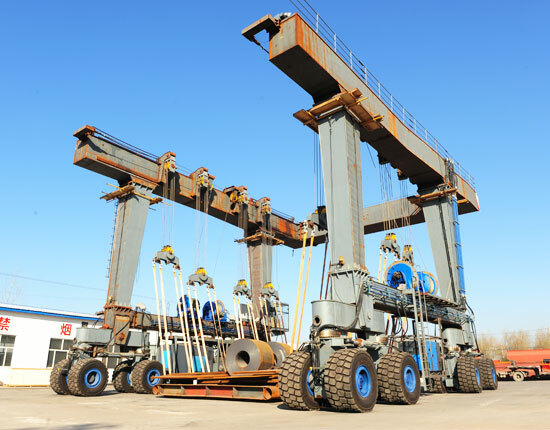 In addition to the crane design and manufacturing, we are also responsible for the equipment delivery, installation, commissioning and maintenance. Whatever types of vessels you need to move, you can find a proper kind of mobile boat crane that provides you with the safest and the most efficient performance. To get a free quotation, contact our sales representative now!